​Canine chiropractic is a safe, all natural and effective form of health care. It is a drugless complement to traditional veterinary care that can help animals naturally heal from existing health conditions, as well as prevent new conditions from arising. Chiropractic is founded on the fact that the biomechanical movements of the spine are directly related to the health of the animal. If the motion of the spine is restricted, the communication between the brain and body is compromised. This can lead to any number of health conditions, including musculoskeletal issues, lameness, digestive trouble, and neurological deficits. Chiropractors affect the central nervous system by delivering a chiropractic adjustment on the bones, ligaments and joints that are biomechanically restricted, thereby increasing the communication between the brain and body. Instead of treating the symptoms of a disease with drugs or surgery, chiropractic treats the root cause of the problem, eliminating the source of the symptoms and allowing the body to heal itself naturally. 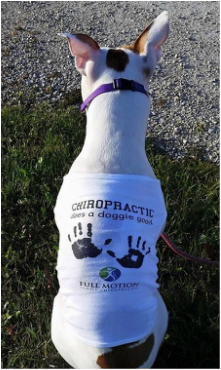 ​Even if your dog is not exhibiting symptoms, he may still benefit from a chiropractic evaluation. In fact, the joint restrictions that require chiropractic care can often be asymptomatic. Over time, these restrictions will cause clinical symptoms which will negatively affect the health of your dog. With regular chiropractic check-ups, we can detect these joint restrictions before they cause symptoms, thereby increasing the health of your dog. It is far easier to prevent a problem than it is to correct a problem.